Dr. Richard Creaghe is the top dentist in Houston, who has been treating patients in this area since 1990. With more than 20 years of experience in dental practice, he has become a part of Houston and the people living here. Houston Dentist DDS is looking after all possible oral health complications of people living in this city. Native to Texas and educated form the University of the Pacific School of Dentistry, Dr. Richard Creaghe believes in continuous education and improvement. He takes courses routinely at the Las Vegas Institute for Advanced Dental Training. Dental implants are the excellent solution to replace a missing tooth or multiple teeth with an artificial tooth and root. In this procedure, the jaw is exposed to hold the replacement tooth. The procedure integrates the jaw bone and structure to prevent loss of bones, gum recession and eventual discomfort. It gives you natural looking teeth. Dental crowns are used to cover decayed or damaged tooth. Tooth having large filling are often covered with crowns to protect the same. It gives you better look and feel, while retaining the functionality of tooth as well. Teeth whitening is probably one of the most talked about procedures, it is frequently requested at the Houston Dentist DDS for improved teeth color. The methods of Houston teeth whitening available at Houston Dentist DDS, under the supervision of the top dentist here are Crest White Strips Supreme Professional Grade, Dentist supervised at home bleach kits and Zoom teeth whitening. 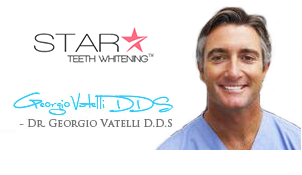 Brite Smile Teeth Whitening is an exclusive procedure, available at Houston Dentist DDS. Your top dentist in Houston, Dr. Richard Creaghe will schedule your for this professional whitening treatment after observing your oral health properly. Dental bonding is done by the top dentist in Houston within 30 minutes; it is not a complicated procedure. You can see remarkable improvement once dental bonding is completed. Dental bridges can give you optimum results when you want a perfect smile. All problems related to a missing tooth or teeth can be corrected with a denal bridge. It can stop shifting of teeth and prevent misalignment. At Houston Dentist DDS, you will get the best dental bridge prepared for you. Clear Correct is an effective Invisalign. Invisalign is a well know procedure, which has replaced metallic braces. It is the best alternative today, in the form of clear and convenient braces that looks natural.